When I was a high school senior, my English teacher assigned (my translation at the time: forced) me to read Henderson the Rain King by Saul Bellow. Henderson is a book about an inherited millionaire in his mid-50s (the book was published when millionaire meant "great wealth," not "the guy next door") who is lost in life and takes it out on everyone around him: his wife, his children, a stray cat, his cleaning lady, his neighbors (he starts a pig farm in his front yard to spite them). Uncertain what to do next, he accepts an invitation to visit Africa with a honeymooning couple. He arrives in Africa and welcomely ditches them in search of undiscovered tribes, which he finds -- and he proceeds to make their lives miserable. In other words, other than being lost in life and wondering who he wants to be when he grows up, this is not the sort of protagonist a high school kid can relate to. Yet read it we did. Even more, we discussed it. We discussed life, what it means to discover who you are, "becoming" versus "being," "truth comes in blows," tragedy, joy, life, death. This was the first "serious literature" I read in high school that I can recall actually having semi-intelligent discussions about with fellow students and the teacher. Instead of the teacher expecting you to recite what students everywhere have been reciting about literary works for decades, our teacher wanted to hear what the book meant to us. Our teacher, Mr. Montgomery (like most of my high school teachers, I am embarrassed to admit he exists in memory with only a last name) led us students on discussions of personal identity and the quest for meaning. He was the first teacher I recall who talked to us like we were adults, even when we didn't always deserve it, assuming we had thoughts in our heads that might be worth hearing. Mr. Montgomery, or "Monty" as we sometimes called in class during light-hearted moments, was a school teacher who was so good at what he did they moved him into "management" writing curricula in the district office. Years later, lucky for me, he took a pay cut to return to the classroom to what he loved -- teaching kids. And his love for teaching showed. Mr. Montgomery exposed me to literature in a way no teacher had, and at a time when I was more able to appreciate it. Honestly, at that stage in life, I wasn't ready to love literature. I still thought our analysis of Henderson was way overblown, and "hero" Eugene Henderson was hard to relate to. But Mr. Montgomery changed my definition of literature; I no longer viewed it as "boring big books sadistic teachers force you to read." In college, an unknown force compelled me to read Henderson -- gasp! outside of class. A few years later, I read it again. And again a few years after that. Each time I picked up the book, I saw Eugene Henderson and his quest for life's meaning in a different way, obviously because I was a different person. My respect for "literature" and the power of a good novel grew. 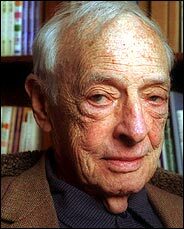 My admiration for Saul Bellow grew -- even though I did put down The Dean's December almost in disgust, thinking the author just subjected me to hours of gray, bleak depression and death. More importantly, my respect and admiration for "Monty" Montgomery grew. On each reading of Henderson , I'd recall some of the book's themes we talked about in class, and I finally understood more of what they (Saul and Monty) were saying. Life even dealt me a "truth comes in blows" moment. This blog entry veers from my usual technical focus. It's my way of remembering two people who had an influential impact on my life: a novelist whose words could make me think about life in new ways, and a teacher who shared more of himself than he had to in order to teach me to think and not just parrot the Cliffs Notes. To Saul and Monty, thank you. I checked to see what the next talk was going to be at my local Java Users Group (the Denver JUG) and saw that Eitan Suez was going to be presenting on The State Machine Compiler. My first reaction was, "What the heck is that?" So I spent a few minutes reading about state machines and realized again why going to JUG meetings is great: JUG Serendipity. By attending JUG meetings, I learn about development tools and technologies I normally would never hear about. Eitan will talk next Wednesday about the State Machine Compiler, a Java open-source (Mozilla Public License) project to automate creating classes that implement the Gang of Four State pattern. SMC allows you to define a "state machine" mapping file that defines the states your object can be in, what transitions trigger movement between states, and actions that should occur upon state transition. Then, in your Java code, you use a generated state Context object to change states when needed. The generated code handles the work of invoking methods to perform the actions and track the state transition. By keeping the state definitions and transition logic in a separate file, you remove all the ugly switch and if-then-else state transition logic from your Java code. The down side is you have to learn a new notation to represent the state machine. Fortunately, the syntax defined by SMC isn't overly complex. And it's not XML! SMC apparently was written originally by Robert C. Martin, then picked up and expanded by Charles W. Rapp. (Apparently not the same Charles Rapp agency that manages Nipsey Russell.) Uncle Bob still has a Java version of SMC available, but without source code.